Extreame Savings Item! 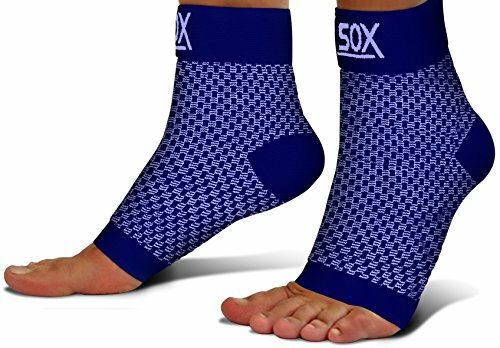 Save 41% on the SB SOX Compression Foot Sleeves for Men & Women - Best Plantar Fasciitis Socks for Plantar Fasciitis Pain Relief, Heel Pain, and Treatment for Everyday Use with Arch Support (Navy, Large) by SB SOX at Enria Industries. MPN: SBSOXPFNN-L. Hurry! Limited time offer. Offer valid only while supplies last. ✅ GREAT INVESTMENT FOR YOUR FEET (GREAT GIFT IDEA TOO!) - We spend so much time on our feet yet tend to neglect our feet. Why settle for anything less than fast pain relief at a great value? And while you are at it, grab a few pairs for your family, friends, or loved ones as a gift that is functional and beneficial to their health! Also, a great gift to runners, athletes, fitness workouts, hiking, tennis, cycling, office workers, airplane travelers, or anyone on their feet all day! ✅ PURCHASE THE RIGHT SIZE FOR YOU - For the best fit, we recommend that our customers do the following two steps prior to purchasing the foot sleeves: (1) measure their arch circumference and (2) then select their size using the 3rd image in our listing. This minimizes the incorrect size being ordered, especially since our foot sleeves are able to fit a wide range of foot sizes (arch circumferences) within our size chart. We have also provided shoe size as a general guide. If you have any questions about this product by SB SOX, contact us by completing and submitting the form below. If you are looking for a specif part number, please include it with your message.